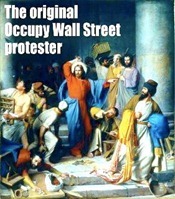 With the growing Occupy Wall Street demonstrations, I’m seeing more discussion about whether or not Jesus would have been one to lead/participate in the movement. This article in the Guardian by Terry Eaglton has persuaded me that he would have: Occupy London are true followers of Jesus, even if they despise religion . 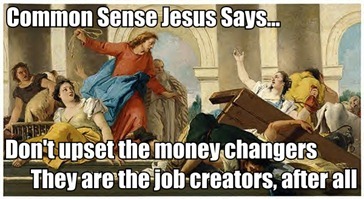 "Jesus’s fury with the money changers was born of anger with the system itself. Yet unlike the campers, his protest was violent." Rather than squat down with a placard outside the Jerusalem temple, he staged his protest within its walls, and it was a violent rather than peaceful one. The fracas Jesus created in this holiest of places, driving out the money changers and overturning their tables, was probably enough to get him executed. To strike at the temple was to strike at the heart of Judaism. This itinerant upstart with a country-bumpkin background was issuing a direct challenge to the authority of the high priests. Even some of his comrades would probably have seen this astonishing act of defiance as nothing short of sacrilegious. Jesus was not an anti-capitalist, any more than Dante was a Darwinist. But he was ready to risk death in order to defend what he saw as an authentic form of giving against a system that impoverished it. As such, he would probably have understood what those currently shivering outside St Paul’s are up to. They have certainly managed to throw the ruling caste of a holy place into an unholy panic, just as he did. And to that extent they are his followers, however much some of them may now understandably despise religion.